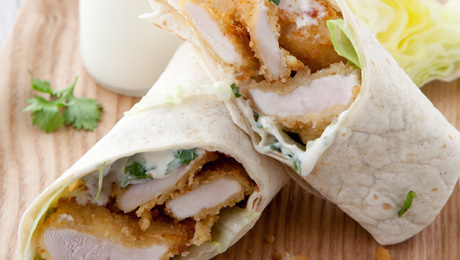 These chicken goujon wraps are great for dinner but can also make the perfect lunch box filler as they can be eaten hot or cold. Preheat the oven to 180˚C/350˚F/Gas Mark 4. Place the tray of chicken goujons in the oven and bake as per pack instructions. Meanwhile, prepare the mayonnaise by combining the mayonnaise with the black pepper, the lemon juice, zest and flat parsley. When the chicken goujons are cooked, lay the tortilla wrap on a board, spread a tbsp of mayonnaise, add some iceberg lettuce and add some goujons. Roll to enclose the wrap.